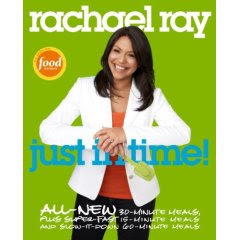 Back during the writer's strike, when stories about the entertainment world were scarce, EW magazine's Mandi Bierly talked to Rachael Ray about a recipe that could fill up all the time left vacant by the lack of shows on TV. Rachael offered a 120-minute meal that is worth the time - Elsa's Cider Beef With Smashed Cheddar Potatoes, which can be found in her Just in Time cookbook (see the recipe below). Make sure the pan is real, real hot before you put in the meat. And make sure you let the meat get really dark all over. This will give your stew great color and flavor. Feel free to add any root veggies you want. Remember: the longer the stew sets, the better it gets. Place a large stew pot or Dutch oven with a lid over medium-high heat. Add the EVOO, 2 turns of the pan, and butter. When the butter melts, season the beef with salt and pepper and add to the pot. Brown on all sides, 7 to 8 minutes total. Add the onions, carrots, and turnips, and cook for 5 minutes. Sprinkle the vegetables with the flour and stir to combine and coat, 1 minute. Stir in the apple cider and the beef stock, bring to a boil, cover the pan, and transfer to the oven. Braise the beef for 45 minutes. Once the beef has been in the oven for about 15 minutes, place the potatoes in a large saucepot with water to cover by at least 1 to 2 inches. Bring to a boil over high heat, then reduce the heat a bit, add some salt, and cook the potatoes until tender, about 15 minutes. When the potatoes are tender, drain them and return them to the pot. Add the milk, sour cream, and cheese. Use a potato masher to smash them to your preferred consistency. Season with salt and pepper and add the chives. Cover and keep warm until the beef is done. Man, Rachael loves her cheese! I'm working on a remake of one of Rachael's recipes from her book "Guy Food". I'll let you now how it turns out!